Up your glam factor with a fur coat! Cherry red looks amazing with yellow, tan, green, blue, white, gray, and black. Fur coats are sumptuous and glamorous (oh and they're functional in keeping you warm)! You are sure to look like a fashion girl in one. 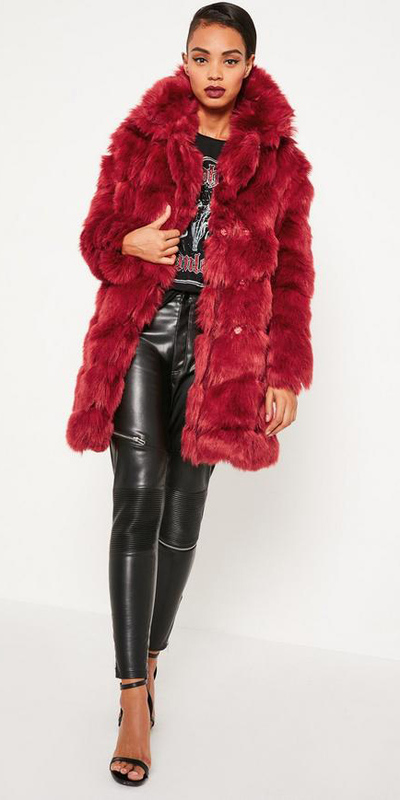 Cherry red fur coats can top just about any outfit in the cold months. Wear them with casual or fancy clothes. Whether you try a bright color like red or purple, or a neutral like gray or black, you'll be surprised how wearable a fur coat is. Wear your fur coat for the weekend with jeans, for lunch with pants or a skirt, over your work clothes to get there warm, or on top of a nighttime look. Knowing how to wear cherry red fur coats is easy with this guide!